ISO Workshop portable is a free application specifically designed to facilitate disc image management, conversion and burning operations. The program has a very simple user interface and enables you to make ISO images, extract specific files and folders from disc images, create disc backups by copying disc contents to an ISO or BIN image file, convert different disc image files into the ISO or BIN format and, of course, burn ISO and CUE images to blank discs. 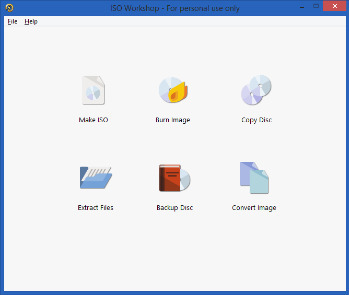 Using ISO Workshop you can easily burn disc image to CD, DVD or Blu-ray Disc. It could be any disc image, not only standard ISO image. Additionally, you can erase rewritable CD, DVD or Blu-ray Disc.